Muskegon County genealogical and historical databases contain personal names from original materials found in county court houses, microfilmed census records, microfilmed birth, marriage, and death records. Birth records are closed. 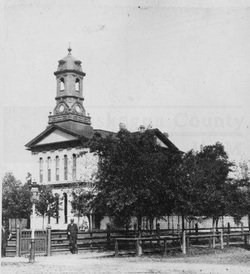 At left: Original Muskegon County Courthouse, undated.